At Imperium Chiropractic, our chiropractors employ a combination of components from multiple techniques, including Diversified, Gonstead, Activator, and Thompson adjusting. Each chiropractor uses their own knowledge and experience to select the best adjusting approach for each of our patients. We always begin with a thorough exam that guides us to the right place to adjust. We communicate the results in detail to ensure that our patients understand their case. Using that information, in addition to x-ray images, as necessary, we craft a customized care plan for each patient. Our chiropractors use motion palpation (feeling the movement and position of the bones) to know exactly where and when to adjust on each visit. Once these malpositions, or subluxations, have been located, a series of specific adjustments is performed. A significant part of a chiropractor’s training is aimed at identifying and correcting subluxations. Our years of experience, along with a thorough understanding of the body and its functions aid us in knowing how to best adjust each patient, and make the process as safe and effective as possible for our patients. With many chiropractic adjustments, there may be a mild “popping” sound that occurs as a result of gas diffusing in the joints. The same as the sound of cracking your knuckles, the “popping” sound does not always occur, nor does it determine the effectiveness or success of an adjustment. Spinal adjustments have a positive effect on the entire nervous system, helping to eliminate interference, and are the focus of your visits. Nonetheless, our chiropractors can also restore appropriate motion in almost every joint of the body, allowing improved function. Using careful palpation of the spine, as well as x-ray analysis, the chiropractors use hands-on adjusting to help restore healthy function and proper mechanics. At Imperium Chiropractic the “Diversifed” approach is one of several techniques utilized by our doctors. Using the information gained from a very thorough exam, and careful analysis of x-ray images, our chiropractors determine exactly where subluxations are located, and when and where to adjust. On each visit, our chiropractors use palpation, or feeling the movement and position of the bones to identify exactly where and when to adjust. Once the subluxations have been located, an adjustment is made using the hands to improve the function of the joint in question. With Diversified adjustments, there may be a mild “popping” sound that occurs as a result of gas and fluids moving within the joints. This “popping” doesn’t always take place, and it doesn’t determine whether or not the adjustment was effective. A full-spine adjusting approach that relies on detailed x-ray analysis and employs specialized adjusting chairs and benches to provide a safe, effective adjustment. This technique is a very specific full-spine approach to chiropractic. Named for its creator, Mt. Horeb, WI chiropractor, Clarence Gonstead, this technique is based on the “foundation principle”. Special analysis of spinal x-rays and unique adjusting “tables” to position the patient allow for safe, specific adjustments. 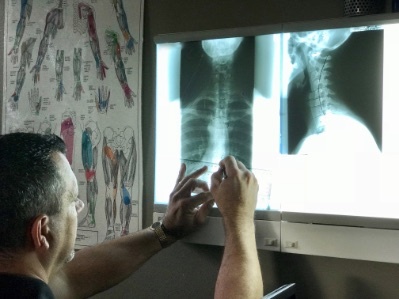 Our chiropractors combine detailed information from our thorough exam and health history with full spine x-rays that are carefully analyzed and explained to the patient. This is matched to the chiropractor’s palpation findings, where the doctor uses their fingertips to feel how the bones are positioned and moving. Once all this information is gathered, the chiropractor knows precisely where to adjust. The adjustments are performed in several positions, including side-lying, or kneeling for the low back and pelvis, and seated adjustments for the neck. Like other hands-on techniques, Gonstead adjustments can cause a mild “popping” sound. This is known as a cavitation. This is the same as the sound that happens when you “crack” your knuckles, and has absolutely no bearing on the success of the adjustment. Our chiropractic care is complemented by a suite of therapeutic modalities designed to help get you out of pain and back in the game. Discover how our techniques and services can help you find relief and experience better health. Contact us to schedule an appointment today.